Season one of the Brad Underwood era in Champaign had its fair share of struggles. After leading Oklahoma State to the NCAA tournament in his first (and only) season in Stillwater, Underwood surprised the college basketball world by taking the Illinois job and a cushy pay raise. But success for Underwood in his Big Ten debut season was scarce. The Fighting Illini won just 14 games and in the months after the season ended, the roster underwent some significant shakeups. Leron Black opted to go play professionally rather than return for his senior season. Mark Smith transferred to Missouri. Michael Finke transferred to Grand Canyon. Greg Eboigbodin transferred to Northeastern. As a result of last season’s struggles, expectations have justifiably been lowered entering the 2018-2019 campaign. However, this Illinois team may be better equipped to carry out Underwood’s directive to play fast and pressure the ball than last season’s group. Whether personnel more suitable to Underwood’s desired style of play translates to more success in year two remains to be seen. It won’t be surprising to see the Fighting Illini to go with a three-guard backcourt set featuring sophomore Trent Frazier, JUCO signee Andres Feliz and prized freshman Ayo Dosunmu. All three players have point guard skills, which should give Underwood plenty of options to handle the ball and facilitate the offense. Frazier was seventh in the Big Ten last season in assist rate and steal percentage and averaged 12.5 points per game. He shot close to 36 percent on 3s in league play on 120 attempts. Just slight improvement from the perimeter will make Frazier even more dangerous. Feliz was ranked the nation’s No. 1 junior college point guard, according to the 247Composite. He was a first team NJCAA All-American and averaged 20 points, 6.1 rebounds, 5.7 rebounds per game while shooting 41.8 percent on 3s. Dosunmu was a huge recruiting win out of Chicago for the Illini. A Jordan Brand All-Star and the No. 32 player nationally, Dosunmu will bring instant offense to the Illinois lineup and his length and athleticism should make him a perfect fit for Underwood’s defense. Aaron Jordan returns in the Illinois backcourt for his senior season after shooting 44 percent on 3s last season. Da’Monte Williams, a 6-foot-3 sophomore, is also back after an up and down debut season. Freshman Alan Griffin could also crack the rotation as a wing shooter. The Illinois frontcourt will be undersized as junior Kipper Nichols could start at the four. A 6-foot-6 forward, Nichols ranked in the top 20 in the league last season in offensive and defensive rebounding percentage. He’s an excellent free throw shooter (85.9 percent) and can also knock down the occasional 3-pointer. Nichols made 31 3s last season and shot 37.8 percent from distance. Three freshmen, Tevian Jones, Giorgi Bezhanishvili, and Anthony Higgs, could also see minutes at the forward spots. In the post, Kent State graduate transfer Adonis De La Rosa is expected to be the starter with 7-foot freshman Samba Kane acting as the backup. De La Rosa averaged 11.8 points and 7.6 rebounds per game last season in the MAC. Overall, this Illinois roster appears to be more talented than last year’s group in the backcourt, but is going to have issues against teams with capable size in the paint. 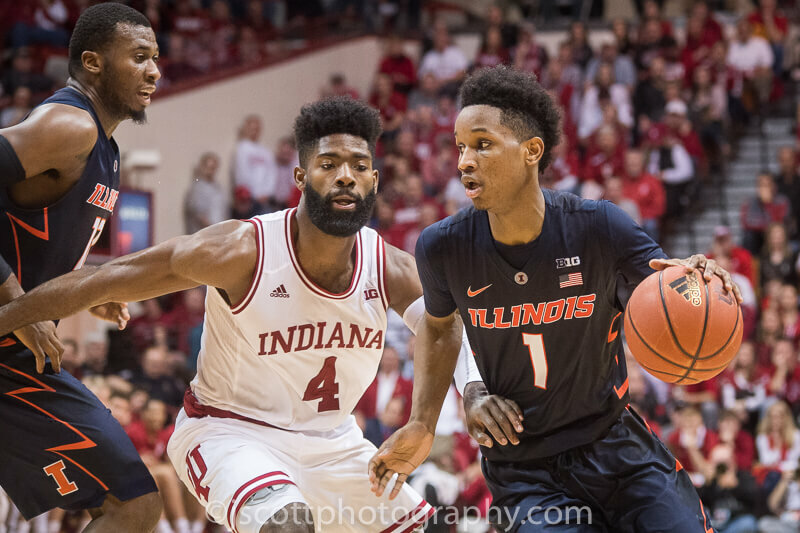 Bottom Line: The preseason prognosticators aren’t high on Illinois, but the Illini have to a chance to be dangerous because of their guard play. Frazier has significant upside and Dosunmu will be one of the league’s best freshmen. If Feliz is able to reliably act as a facilitator for both players, Illinois will have two capable playmakers on the wing. The roster attrition is also likely to be a net positive for Illinois as Underwood and his staff now have a roster better suited to their style of play. Last season’s roster was put together hastily after the job transition and this year’s group should have pieces that fit better together. It’s a stretch to project Illinois anywhere other than the bottom five in the league, but this is a group that should improve as the season moves along and could produce some upsets in the State Farm Center. Quotable: “He’s a very big guard. He’s very hard to stay in front of. I think he’s one of the best freshmen guards in the Big Ten, maybe even the country. To be 6-foot-4 like that with his length, and he’s actually very quick. Me and him going at each other every day at practice, I think that’s very key for this team because it’s going to come down to me and him being one of the top point guards in this conference. Us playing together in the backcourt, I think this is going to be unbelievable for us this year.” – Frazier on Dosunmu to Jeremy Warner of 247Sports.